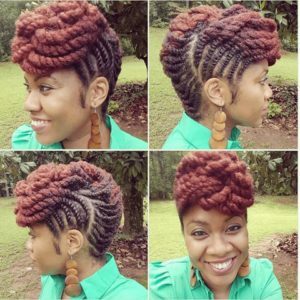 A great and super chic alternative to braids are twisted hairstyles! 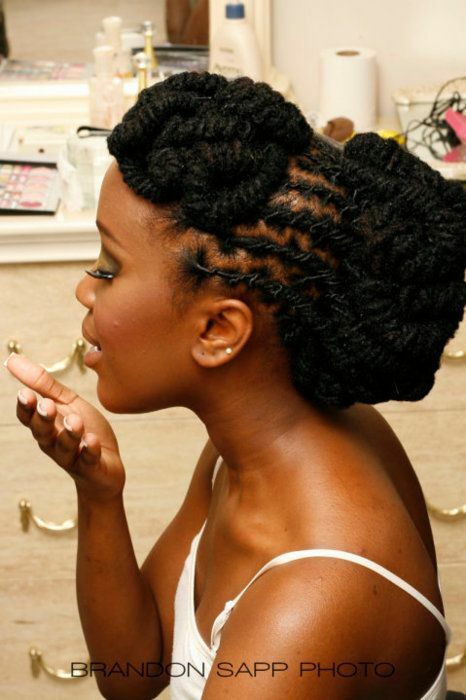 If you want a new look for your natural puff, then check out these awesome 30 chic and stylish twist inspired hairdos. Remember when we were little and our momma used to do our hair like this after a wash and it was the coolest thing? But as we grew up, we decided we’re too cool for this do.. Well, folks, this twist hairdo is IN and you can wear it all year round! 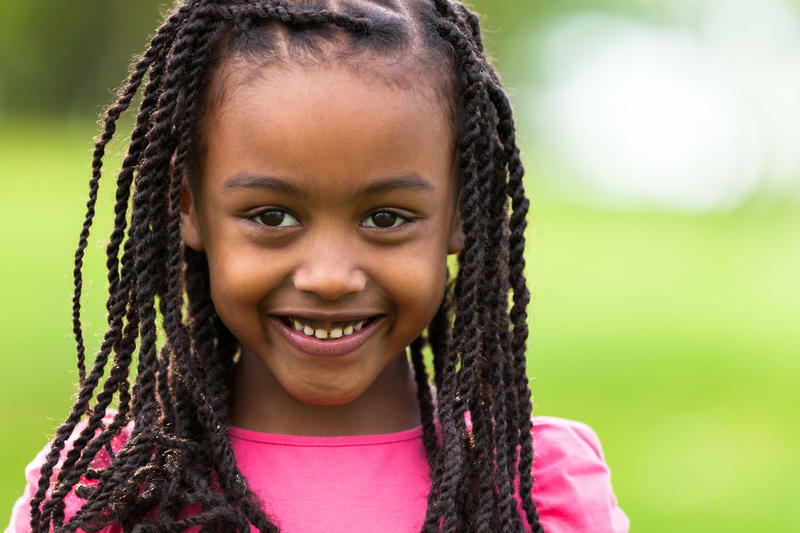 Throw on a pretty head-band and some make-up and you’ll become this beautiful princess sporting our ancestral pride. I love these fluffy two strand twists! They are an easy wear all week and an easy twist out for a great look on a weekend date night out. 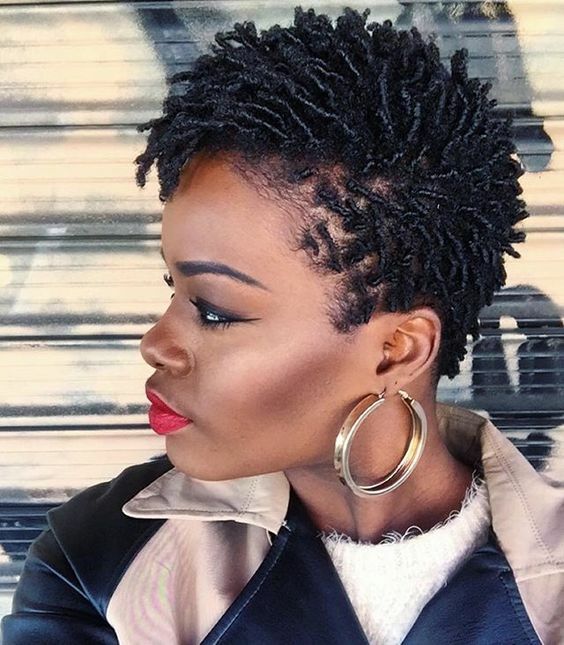 Twist outs are now one of most trending hairstyles for us women. To achieve this look, you’ll first need to moisturize your natural hair, then divide it into section and start twisting it out. When you finish, let your hair dry completely. There are a myriad of combinations and patterns one can do for this twist style. 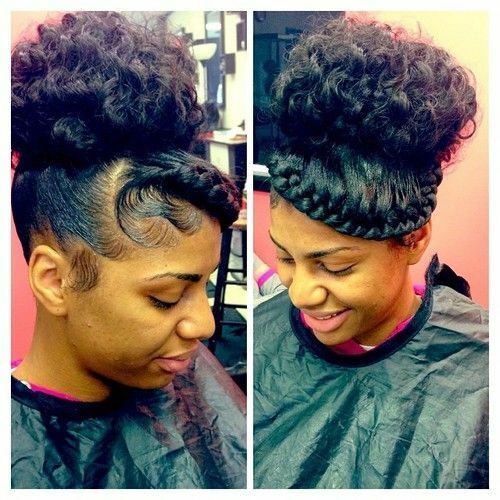 The possibilities are endless which is why this particular Mohawk style is so popular. 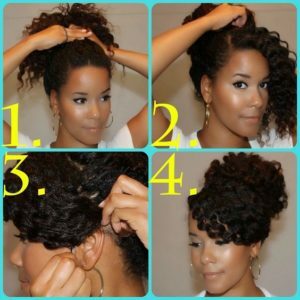 You can even unravel a few of the twists to the front and let them hang as a curly bang for shorter hair. This model’s brown to faded red ombre hair also compliments this style. This silky twist bun style was trendy a few decades ago and it’s now coming back! 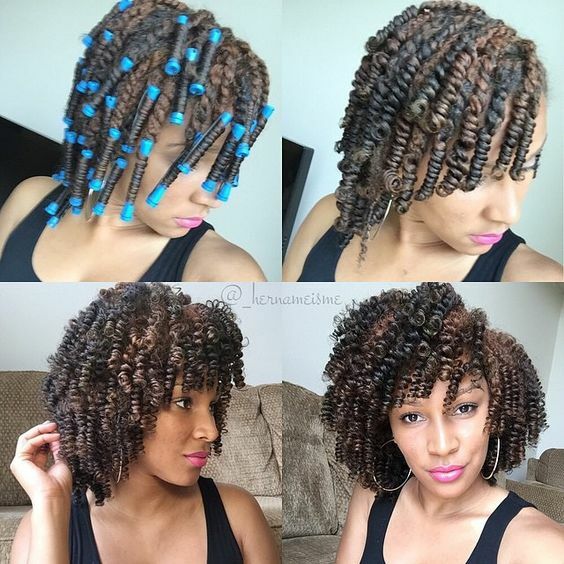 Well, crochet twist are not natural, but we love them so much! Bless the person who created a way to have flawless braids without your own hair sticking out of it! 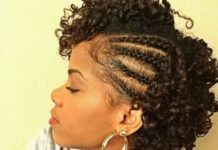 These braids can be purchased by the pack of pre-twisted strands ready for installation into your neatly cornrowed hair. Not only it is cute, but also time-saving. 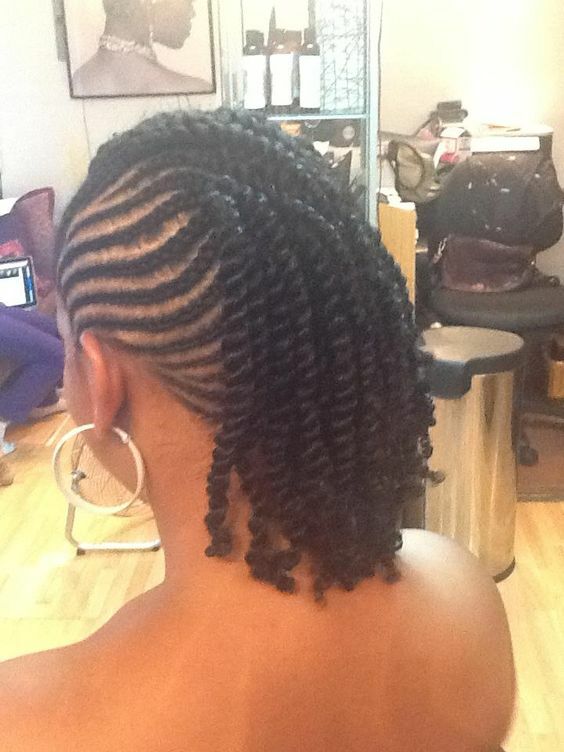 These Senegalese twists are rope twists done with Kanekalon Jumbo braiding. The technique was originated in Senegal just like the name suggests (you don’t say!!). 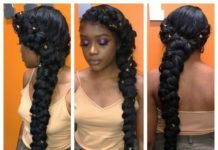 This model also has some hair accessories on a few of her strands. 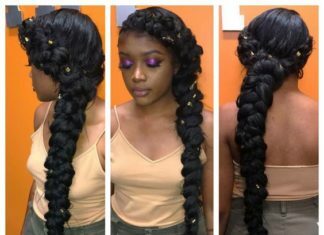 You should know that this style may take hours to install and is sometimes heavy although it looks amazing. Yep, they’re worth the time! 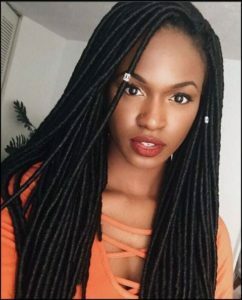 This is similar to Senegalese twists but need a third strand of hair to install and just use regular braiding pattern before merging into twist. 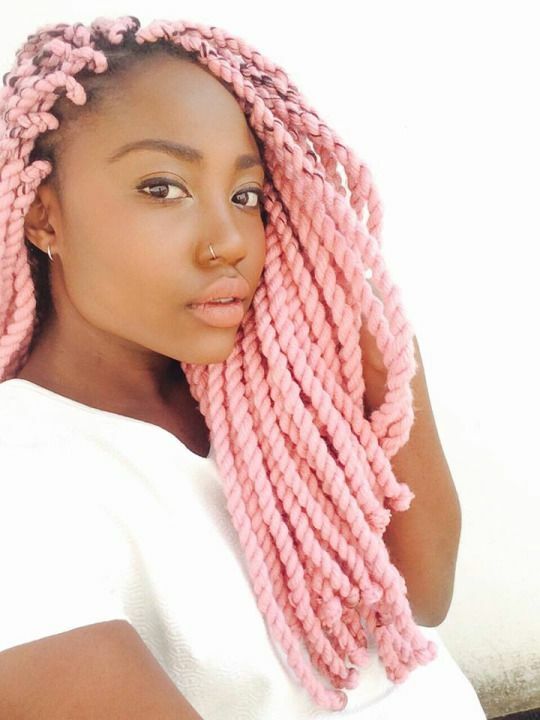 We love this model’s hair color! 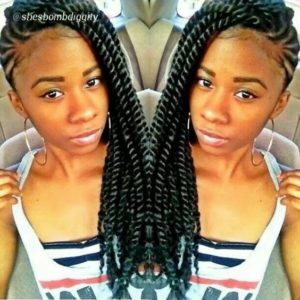 These are known as such because they use hair extentions packaged as Marley Braids. It closely resembles natural hair as its texture is kinkier than Kanekalon fiber. The upside is that the hair can be reused. Isn’t that cool?! 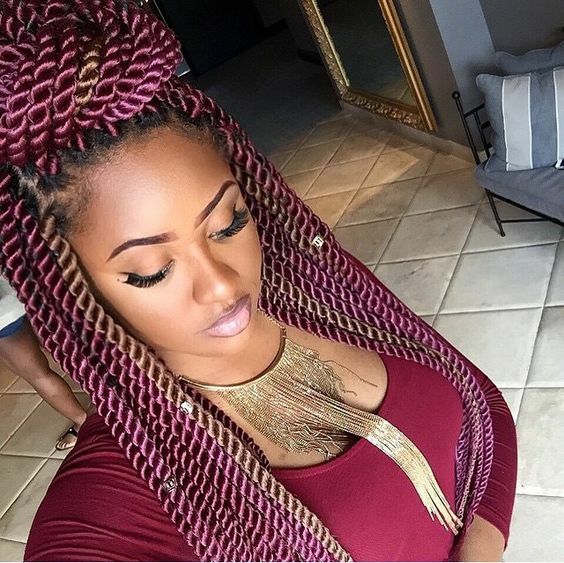 These ombre twists allow you to sport a two-toned braided do. It actually looks the best on Marley braids than with regular Kanekalon. What the stylists do is blend two different fiber colors together a little ways after twisting down the first color. 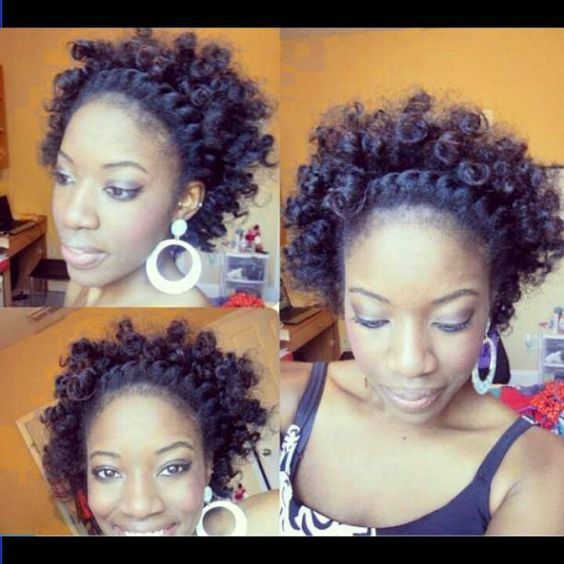 Another version of twist out, except in this style the hair comes out more spiral that with a flat twist. A great, funky option for a girls’ night out! Another fiber used for braiding is actually the same thing grandma used to make sweaters for some of us for Christmas. It’s great a protective style, especially good for winter. To all the locked up (no pun intended) sisters out there, this one’s for you! 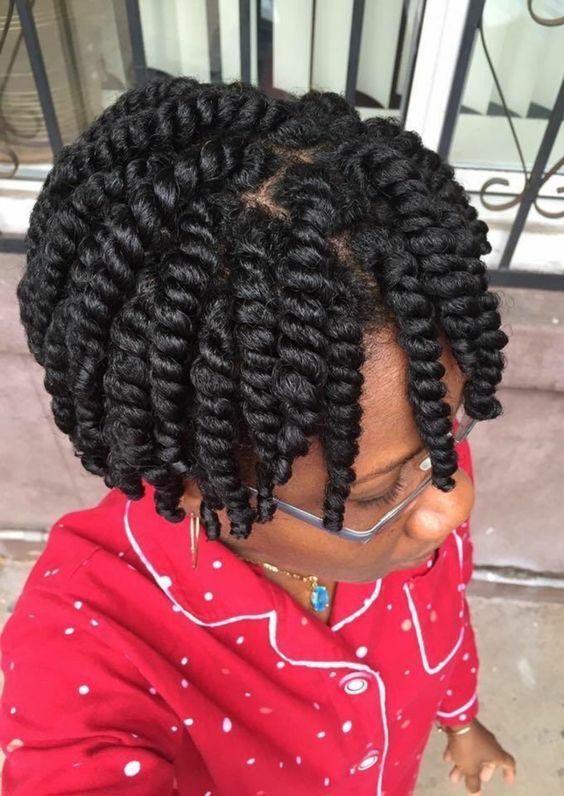 We absolutely adore seeing twisted styles and coils on locs. It allows versatility and a fashionable do. Isn’t this lovely? 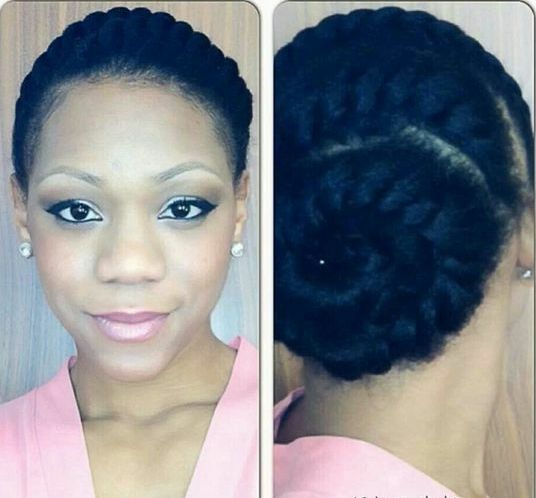 A simple yet elegant updo by just twisting out the ends of your hair and wrapping them under to make a bun. The style is suitable for work or church. 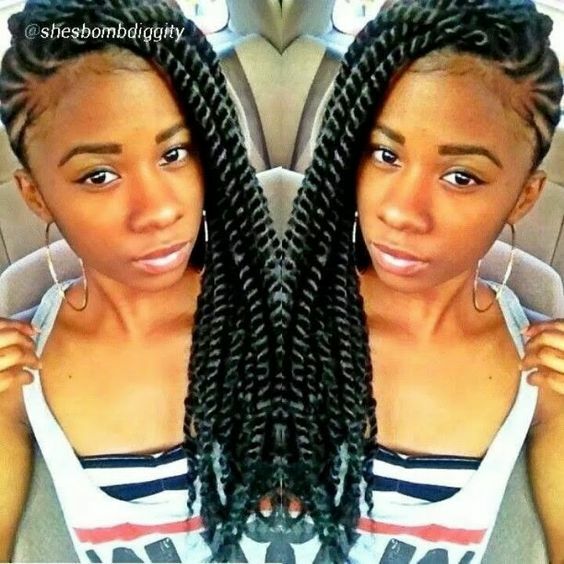 This one can be done braided or twisted in the front. The effect is still undeniably beautiful. It’s also enhanced by nicely laid babyhair. A technique your stylist may use for the braided section of the hair to pull in the smaller cornrows into the larger ones. 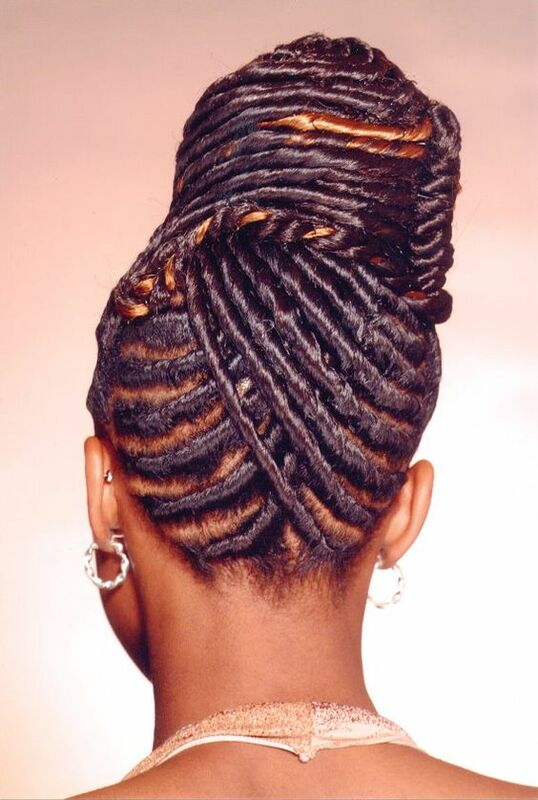 She then finishes the hair with layered twists all pinned down. Another timeless and trendy version of twists created by using a fine tooth rat-tail comb, holding gel and moisturizers to roll the hair into exactly that! 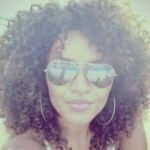 Most women and some men do this style in the initial phases of a grow out. It’s easy to manipulate daily and requires little maintenance. This one is done by unravelling the twist done in the bang area and pinning them underneath themselves to create a little curly bang. It creates a cute but stylish do and can be rocked by adults and children alike. Just adorable! 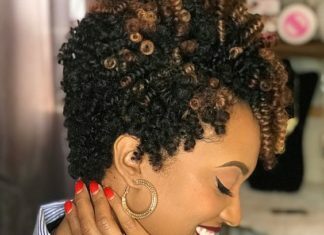 Another sassy yet classy rendition of a twist out. 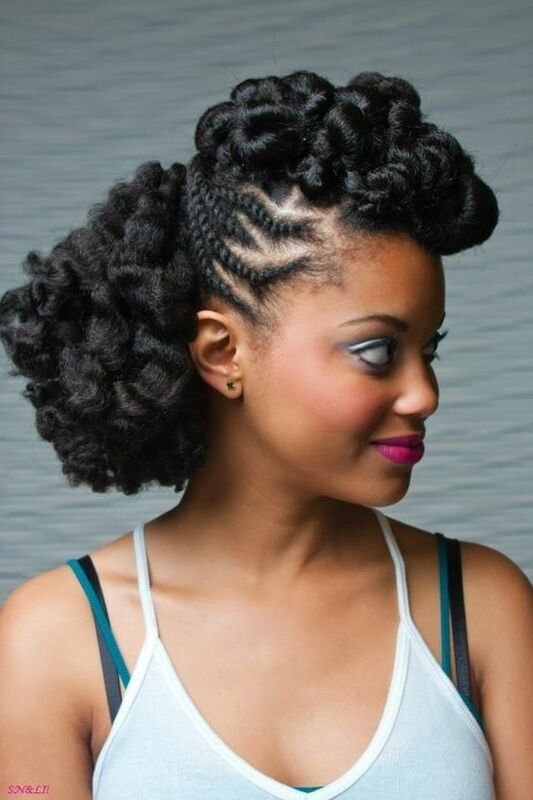 I’d rock this one if my twist outs are getting frizzy and untamed. The waves in the front will frame your face very nicely for a soft ripple effect. Works well for a nice date night as well. 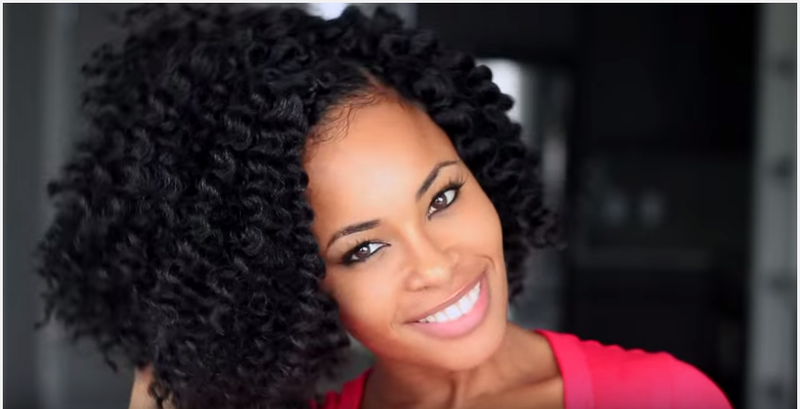 Fluffy twists are done by loosely wrapping two strands of hair around each other. 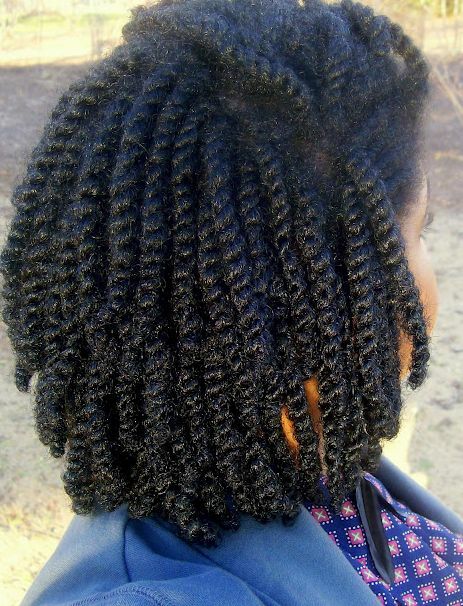 Nice pre-cursor to our beloved twist outs. 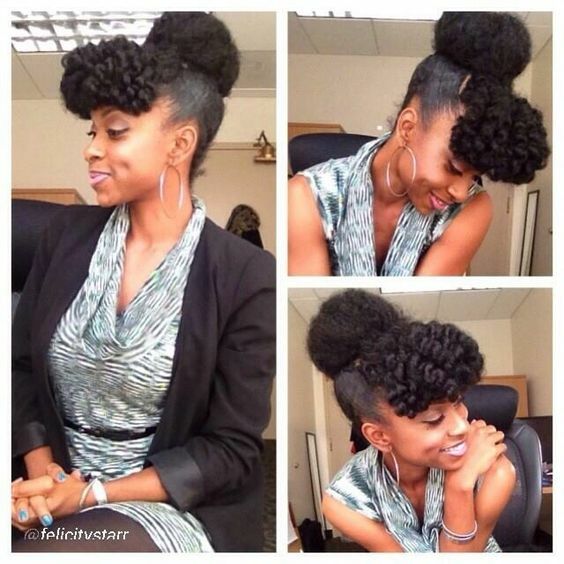 A stylish way to wear long Mohawk updo. 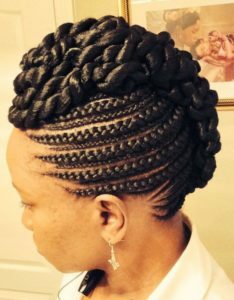 By parting the hair and making a few small cornrows beside the parts, then pulling all the remaining hair towards the middle. 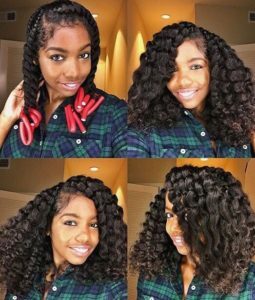 If you’ve got naturally long hair, then simply do a few chunky twists with the ends and pin the under. If not, you may get extensions with Kanekalon fiber and then secure those down with hair pins. Either way, this hairstyle is a must-do in your life-time of styles. 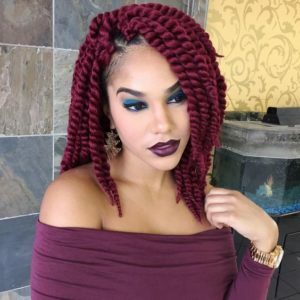 This hairstyle is shockingly a form of a twisted hairdo.The stylist will use Kanekalon fiber to first braid your hair out to the desired length of the locs. 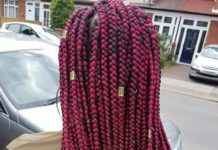 Then they will either use, Kanekalon fiber, Marley Braid or yarn to wrap over the plaited hair all the way out to the ends. The perks to wearing this do is definitely the fact that it can be removed and reinstalled without damaging your own hair in whatever state it is, unlike most real locs where you might need to either grow it out or get a haircut. We love this Cornrow Mohawk do. It simple and natural. A simple braided do for day at the office. A side-part twisted style and a twisted bun at the back. 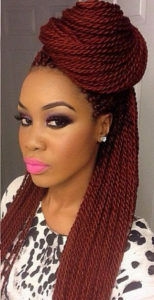 Beautiful thick braids in a variety of colors are also IN this season and are truly a timeless style. Be careful with these ones though, as they can be heavy for some and may damage the edges. To prevent it you’ll need let the do stay “down” for a few weeks before being pulled up into a bun. 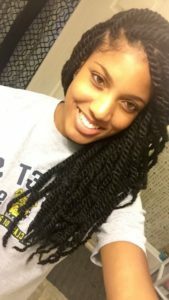 Wanna look like a celebrity for a day? Then this one is definitely for you. 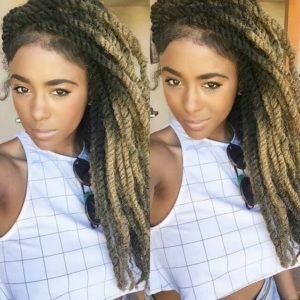 By parting out the center middle section of your hair then the lower back and catching those two lower sections up with a small hair tie. 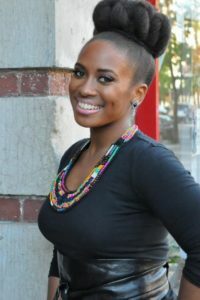 If you do a section in the front down your face with a chunky, loose twist then bend it backwards and continue on loosely flat twisting down to the end of the hair. 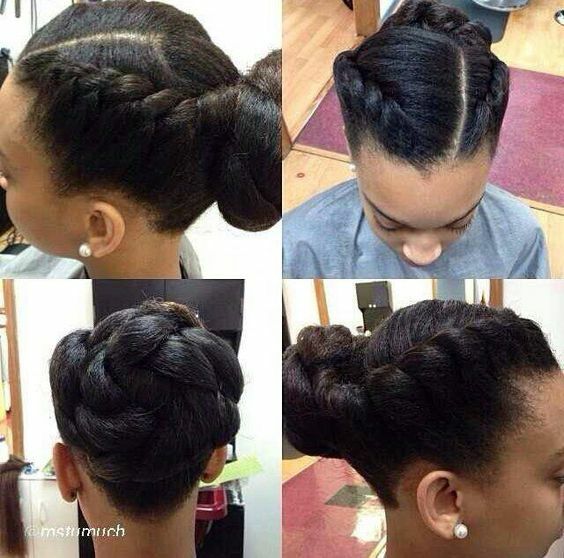 Tuck the end back up, pin it and fluff the entire style. Now you are red carpet ready! A casual hairstyle achieved by unraveling bantu knots at the back, at the sides doing a few stylish flat twists and at the front, connecting a few rubber band twists. 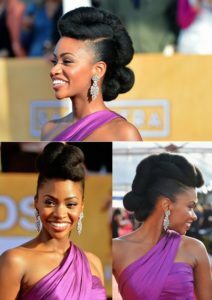 Beauty is in the eye of the beholder which must be everyone’s eyes then, because this style is gorgeous. 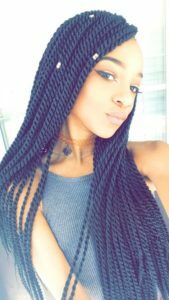 The hair used is slightly thicker than Marley braids and is braided to one side. 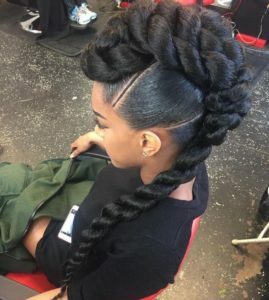 The crown braid section of this beautiful do acts like a head band. 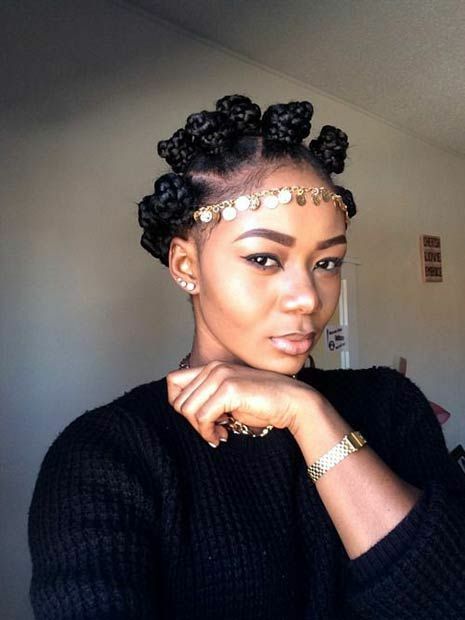 The model has unraveled her bantu knots in the middle for a style that fits any naturalista. This style may also be worn by our sisters with processed hair. Want an elegant and unusual style? Then definitely try this one. Start at the front and keep parting out sections as you go along, leaving out no ends. 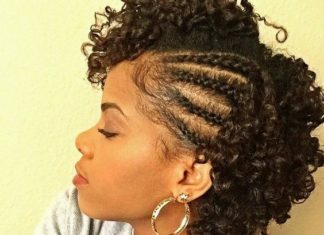 There are so many more cool twist inspired hairstyles that you can do. 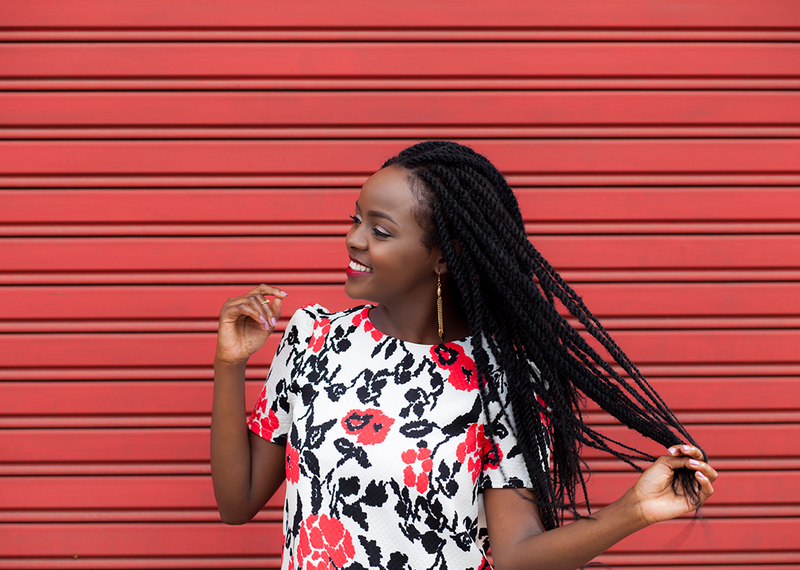 Whatever style you choose, never be afraid to put you stamp of individuality on ’em and you’ll be on a roll to another hairstyle you’ll love.